While Aamir Khan's photo speaks a thousand words, even Katrina did not feel the need to attach a big enough caption to it. We just spotted Aamir Khan on Katrina Kaif's Instagram and it defined the term "thug life" just perfectly. The photo, shared by Katrina, appears to be from the sets of Thugs Of Hindostan, in which the co-star share screen space for the second time. Katrina and Aamir previously co-starred in 2013's Dhoom 3. While the photo speaks a thousand words, even Katrina did not feel the need to attach a big enough caption to it. She merely added '#thuglife'. 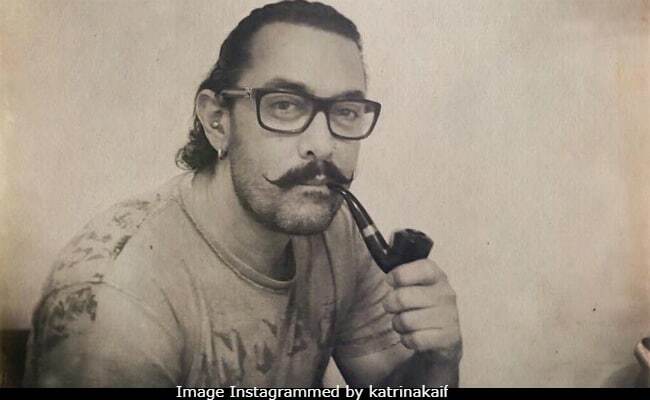 In the photo, Aamir can be seen smoking a pipe (or he's just posing with it) with comments like "legend" and "awesome" pouring in on her feed. "He is a real thug," read a fan's comment. Katrina and Aamir co-star with Amitabh Bachchan in Thugs Of Hindostan - it marks Katrina's first project with the 75-year-old megastar. After taking a look at it, do you think he looks any bit nervous in the photo? Big B must not have been around then because in a recent interaction with news agency PTI, this is what he said about working with the megastar: "I was shooting for Thugs Of Hindostan and I am a huge fan of Amitabh Bachchan. When I got to know that I am working with him, it was really exciting. Finally, he was in front of me, we were rehearsing, and it was really a fan moment for me. I really couldn't speak properly or remember my lines. I was a little spaced out. And I must tell you, it was joyous for me to shoot with him. Every moment with him was a fan world moment for me." Katrina Kaif, Aamir Khan and Amitabh Bachchan filmed the first sequence of the movie in Malta, from where she shared photos of herself in her Thug special look. Directed by Vijay Krishna Acharya, Thugs Of Hindostan releases on November 7.